It’s Friday morning early October and the weather has taken a dramatic turn for the worse. Yesterday we enjoyed a beautiful, warm clear fall day and today we are surprised by a cold snap.There is even snow sprinkled like powdered sugar on the tops of the low hills across the lake. At the farm a dozen preschoolers say good bye to their mothers, fathers, nannies, grandparents, and younger siblings, ready to embark on the day’s journey into the woods accompanied by their two teachers, Tatjana and me. It‘s cold and it’s wet but no one is bothered, least of all the kids as we are all dressed appropriately for the weather, many layers and waterproof hiking boots, rain pants and jackets. As we wait for the last child to arrive, the children clamber into the basket swing hanging from the tree outside our farm house playroom and spin around as fast as they dare. 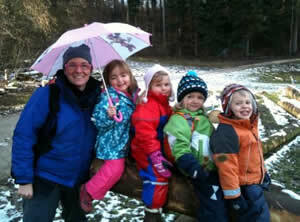 So begins a typical Friday at Sunshine, a multi-lingual, Neohumanist preschool run by Tatjana Popov in a community on the lake of Zurich, Switzerland. I say good morning to Farmer Hoffmann and we exchange pleasantries about the sudden change in the weather. He shakes his head commenting on his preference for a more gradual slide into winter as he readies his four-year-old grandson Rohan for his morning adventure in the forest with us. Rohan is a typical Sunshine student in that he hails from a multicultural and multilingual family. Rohan, his three siblings, his Swiss mother and Mexican father live together with Swiss Grandparents on the family farm about 30 minutes outside of Zurich. Rohan speaks, Spanish with his father and Swiss German with his mother, grandparents and local community. His parents communicate with each other in English and Rohan now, at the ripe age of four, is furthering his exposure to the English language through participation in our forest playgroup. I greet Rohan with a hearty “Good Morning” and he answers eagerly in English. Rohan’s good nature and easy confidence are noteworthy. And why not be self-assured, as we are about to embark on a journey into his woods. At just four years old, he knows the better part of his Grandfather’s forest like the back of his tiny little hand. In many ways better than I. Last week while returning to the farm after an exciting morning in the forest, Rohan explained to me the way to Samiklaus’ house (the Swiss Santa Claus) the accuracy of which is enthusiastically confirmed by his mother later that afternoon. Rohan is a fortunate child indeed. Since birth he has been cultivating a sense of place and a personal relationship to the natural world with all the benefits it brings. Switzerland’s landscape is undeniably gorgeous and the Swiss have a deep respect for and intimacy with the natural world which has captured my imagination completely. “It’s as if the whole country is one big national park!” I exclaim to my friends and family back home in Boston, Massachusetts. No wonder I have made it my home for the past twelve years. The whole country boasts a network of well-maintained walking paths, “Wanderwegs” through field and forest, traversing public and private land alike. Cog railroads and gondolas make slopes at higher altitudes accessible to all and the hills are peppered with small huts for weary hikers to overnight in. Access to nature is superb. Utterly inspired by this way of life and with two young children of my own, I dived head first into the world of nature pedagogy as imagined by the Swiss – a pedagogy that was developed first in Germany and Scandinavia, where as early as 1950s, the first forest Kindergartens or “Waldkindergartens” were taking shape. 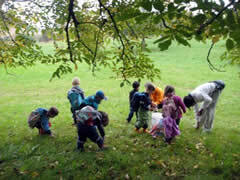 Now forest kindergartens and preschool programs are popping up like wild mushrooms all over Switzerland and the influence of this movement is reaching across the world. Nowhere is this approach more needed than in the US where parents and educators struggle to counter the negative effects of a generation out of touch with the natural world. In his influential book, Last Child in the Woods: Saving Our Children From Nature-Deficit Disorder, author Richard Louv asserts that contact with nature is essential to healthy childhood development. He explains that studies are beginning to demonstrate that time spent in nature has measurable positive influence on children. From countering childhood obesity to managing stress and ADD, to increasing creativity and fostering leadership skills, children are benefitting greatly from the great outdoors. Inspired by the synergies between the European “Waldkindergarten” model and our Neohumanist curriculum we began our Earth Lovers nature playgroup last fall with just four children. One short year later, our expanding circle of love has grown to include some fifteen children, three teachers, a host of local animals and untold species of trees, flowers and insects not to mention the fire, the rain, the wind and the earth itself. We plan to start a second group in the spring. On a typical morning we slowly take leave of our everyday world. We mark the beginning of the journey by singing good morning to the sheep on the farm and venture down the small private road lined with fruit trees and grape vines. A reflection of the changing seasons, each day is different. What’s new today? Any new wildflowers to pick, blossoming apple trees, ripe plums or juicy grapes to reach for? For us, a trip to the forest is not a destination but an endlessly variable journey. Our circuitous paths offer many possibilities and perspectives. How different our special places seem as we arrive in winter or summer, from the North or South, via the swampy field or the overgrown path. Our forest is a multifaceted world with varying landscapes within. And like “The Hundred Acre Wood” of A.A. Milne’s children’s classic Winnie the Pooh, there are special places within that give the place its magic and meaning. 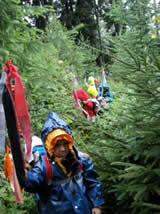 There is a unity to the forest – a healthy wholeness – a world rich and varied and delicately in balance. This beautiful outer landscape exemplifies the unity-in-diversity and the emergent quality of nature in harmony. It becomes a mirror of the healthy inner landscape we aim to cultivate in our young charges as well as in ourselves. Together we experience this healthy wholeness with the wholeness of our own beings. Our bodies, minds, emotions, imagination and our spirits are all active, engaged, and challenged in an integrated manner. Our senses are alive and we are present to ourselves, each other and to the day. Our days are like an improvisational dance. The self-directed inquiry of the children gently supported and facilitated by us teachers and orchestrated ultimately by Mother Nature herself. Young bodies flourish in the great outdoors which offers fresh air, large unencumbered spaces for experiencing the joy of free movement and endless opportunities for sensory exploration and developing physical skills. One wet spring morning two children run through an enormous puddle in the field with joyful abandon. 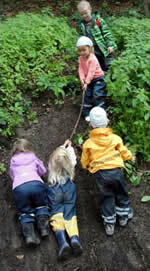 Later a group of preschoolers negotiate a slippery hillside. In this single activity children are not only developing their gross motor skills but their cognitive and social skills as together they attempt to devise a successful way up the hill. 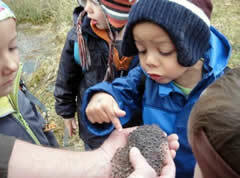 A trip to the pond reveals a fascinating handful of slimy gelatinous frog eggs. We vow to return later to look for tadpoles and young frogs. Intrepid adventurers make their way through the overgrowth of the jungle path and later learn the basics of building a campfire. 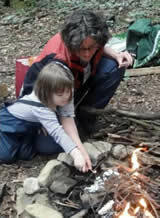 Self confidence and self reliance are fostered as children encounter the elements with a sense of humility and respect. 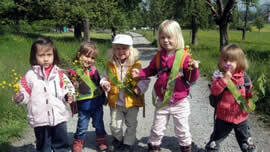 Picking wildflowers is a daily occupation and the children create some impressive bouquets … usually gifts for mom or dad. With sticks, and stones, and leaves and moss, the children build fairy houses of various designs throughout the forest. We visit them regularly and much dramatic play ensures. 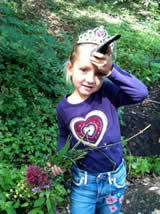 Minna finds an old knobby stick and is transformed into a unicorn princess. The myriad changes of the autumn season bring out the observer in all of us teaching us the arts of stillness and attention. Like a band of little squirrels the children gather walnuts on the farm and make decorations from the colorful leaves, seed pods and nuts further developing their fine motor skill and sense of beauty. As we gather round the pond, the entire group remains silent and still. 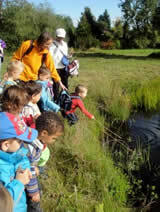 With open eyes and ears we scan the reeds for signs of life, a croaking frog, a dragon fly, perhaps even a fish. 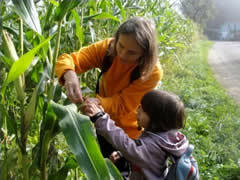 Tatjana and Lino study a ripening ear of corn. In the coming weeks we may watch the farmer harvesting his crop. During the cold winter the forest sleeps peacefully under a blanket of snow and our attention turns towards each other and the warmth of our human connections and community. In the distance Samiklaus chats with the locals on horseback. He is coming our way! 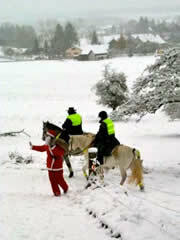 Samiklaus pays us a surprise visit in the forest. Together we warm ourselves by the fire and share hot tea and roasted apples. We at Sunshine are clearly so blessed! We have every advantage and do live in a kind of paradise. I am filled with a deep sense of gratitude as I look back on our first year in the forest. But what about those less fortunate than we – those teachers and children living and working in areas where access to nature is limited, where fear, real danger and lack of resources not to mention cultural antipathies are very real obstacles preventing kids from experiencing the outdoors. How do we inspire others to make the most of what they have? We might begin by simply coming into deeper dialogue with one another and sharing ideas about how, in our area, we are finding ways to bring children into direct contact with the natural world. 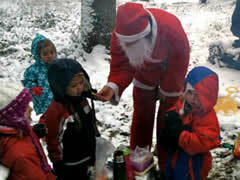 Please feel free to contact us via our web site atwww.sunshine-kids.ch or at jane_greis yahoo.com. I look forward to a rich exchange.